CinemaBomb: Daddy Longlegs / Go Get Some Rosemary. 2009. After months of being alone, sad, busy, sidetracked, free, lofty, late and away from his kids, Lenny, 34 with graying frazzled hair, picks his kids up from school. Every year he spends a couple of weeks with his sons Sage, 9, and Frey, 7. Lenny juggles his kids and everything else all within a midtown studio apartment in New York City. He ultimately faces the choice of being their father or their friend all with the idea that these two weeks must last 6 months. In these two weeks, a trip upstate, visitors from strange lands, a mother, a girlfriend, "magic" blankets, and complete lawlessness seem to take over their lives. The film is a swan song to excuses and responsibilities; to fatherhood and self-created experiences, and to what it's like to be truly torn between being a child and being an adult. Directors: Benny Safdie, Josh Safdie. Cast: Ronald Bronstein, Alex Greenblatt, Sage Ranaldo, Frey Ranaldo, Victor Puccio, Lance 'Batman' Chamberlain, Baker Suitson, Peter Cramer, Eleonore Hendricks, Sean Price Williams, Dakota O'Hara. 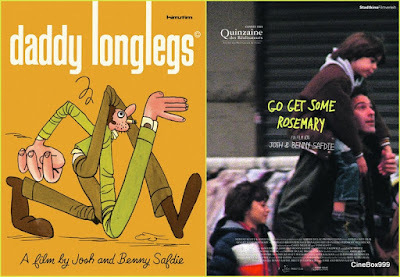 Download Daddy Longlegs / Go Get Some Rosemary.